BANFF, ALBERTA, Canada – Relax after an invigorating 8-minute helicopter ride to a high mountain valley, with a one-hour guided hatha yoga experience. Stretch and breathe deep while taking in the spectacular panoramic mountain landscape of the Canadian Rockies. Once your mind and body are awake, enjoy a gourmet lunch alongside a creek, part of a 3-hour hike, before boarding a helicopter for your second flight of the day. 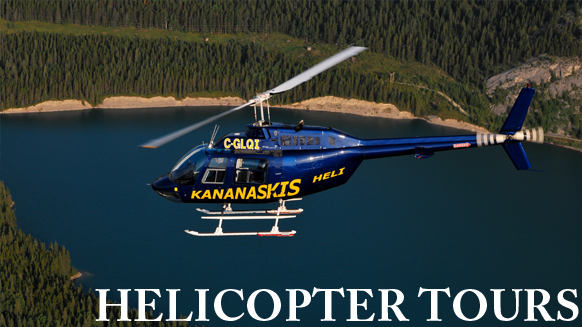 Whether you stay a day or spend the night, our Heli-Fishing tour is perfect for getting away from it all. A helicopter will drop you off at a pristine fishing location in Banff, leaving you all the time you need to unwind and cast a few. Bring your friends, a guide, or go solo to enjoy the clear, jade mountain waters and breathtaking views that make our fishing tour one of the best in the Rockies. So, go ahead, pack up your rod and camping gear and hang that “Gone Fishing” sign. For our Adventure Tours (hiking, fishing, caving), please bring a small pack with a wind-breaker or water-proof jacket, a sweater or fleece pullover, and wear comfortable shoes. ATV’s are powerful machines that require basic skills imperative for your safety. Many experience their first ride with a friend, and although most owners have good equipment and are careful with new riders, you need to know how to keep it safe.